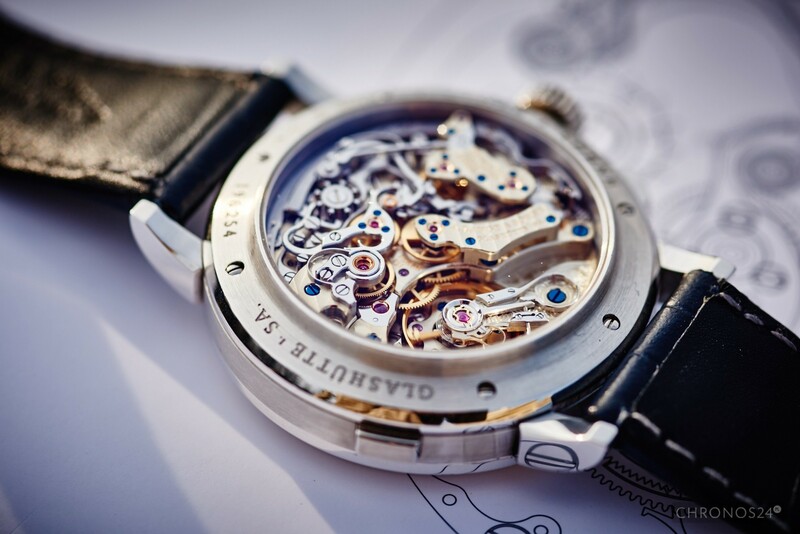 Watchmaking industry has given birth to millions of watches, but only few of them are near perfection. Datograph is an almost complete timepiece, which this test seeks to prove. Have you ever wondered what a perfect watch should be like? Of course – perfect from your own perspective, taking into account your own tastes, preferences and needs, because each of us has their own character. My perfect timepiece should have a few elements. 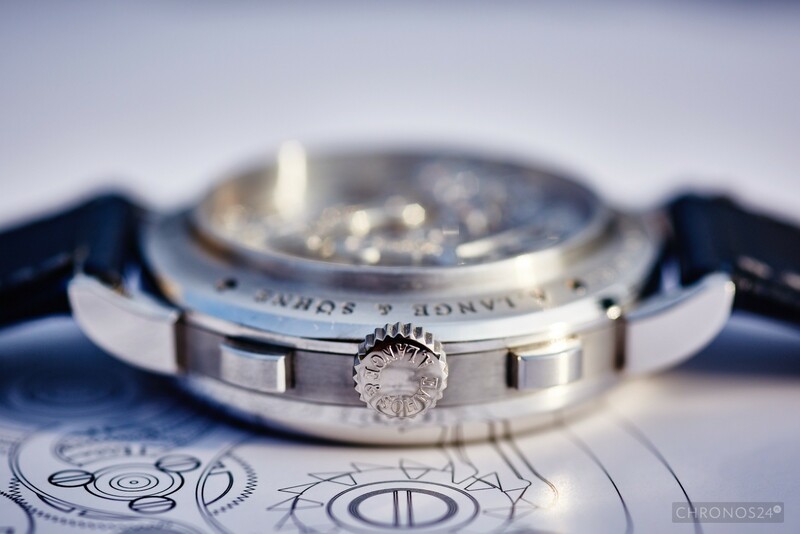 Naturally, design is the most crucial, because we buy a wristwatch with our eyes and so do we fall in love with it. A few years ago I would write about a massive case, at least 44mm in diameter, sporty style and a seriously complicated dial, a watch like a Hublot – where “more means better”. I would look at minimalistic classical designs as “grandfatherly”, but because tastes change… Quintessence of watchmaking design is classics, minimalism, where “form follows function” and where the visual aspect makes a clear, universal and immaculate background for the underlying mechanics. 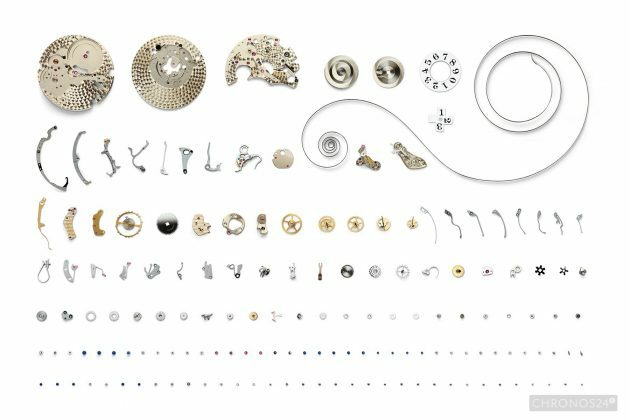 Mechanics, in turn (in watchmaking this is the most crucial aspect, hands down) ought to be precise, functional, and of top-notch quality. I do agree with the fact that nowadays nobody buys a mechanical watch only to have it show precise time, it is cool to have a timepiece (especially if it was worth a small fortune) which maintains high standards of accuracy. It is also good if it is equipped with useful functions, such as a date indicator, and a few extras. 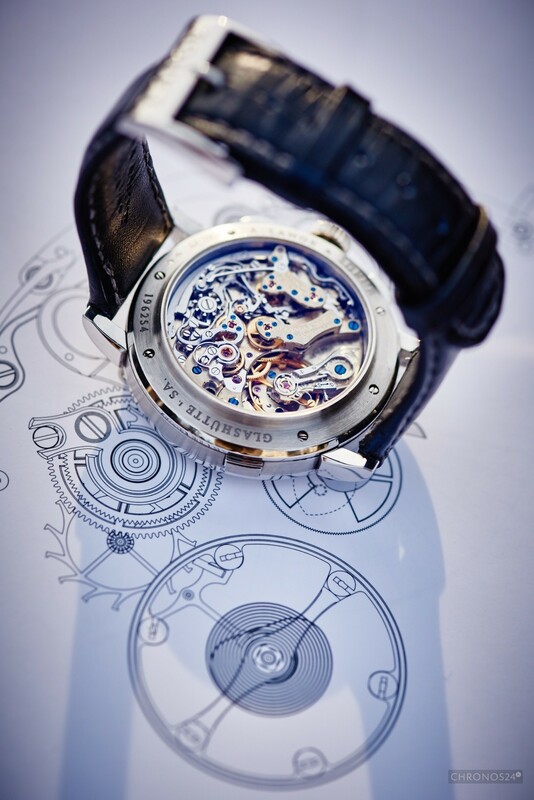 My favourite complication is the chronograph – because of its complexity, looks, and the pleasure of use. Naturally, everyone would like to enjoy the highest standards of finish in their timepiece, but here – budget is the determining factor. 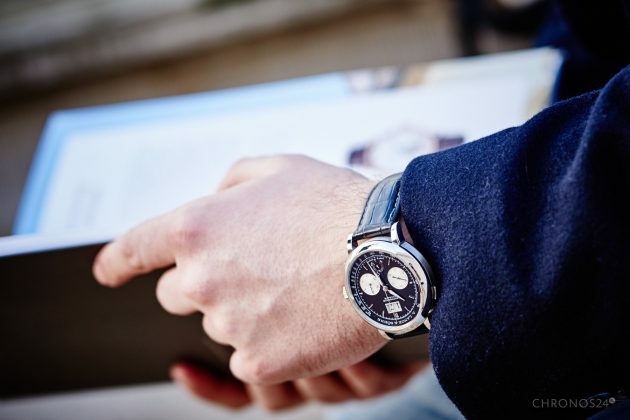 A watch which is passionately crafted to the last smallest detail and hand-made must cost considerable money (which, however, does not mean that lower-class watches are not well-crafted). 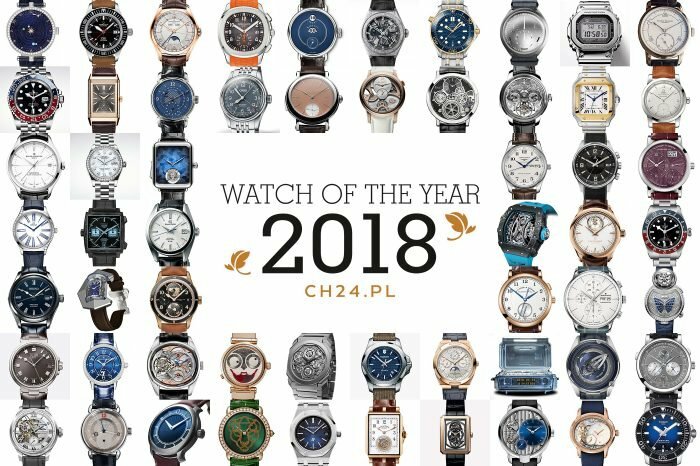 Combining all of the above, we see with the eyes of our soul a watch of our dreams – and it so happened that I was able to wear such a watch for two weeks of a CH24.PL test run. We were quite timid to ask for the Datograph Up/Down, but when it arrived through a dedicated courier service, straight from Glashütte, I was opening the package with shaking hands. Yes, I know, it is only a wristwatch, but when you add passion, emotions come on their own and I am sure you know the feeling. Is Lange & Söhne Datograph Up/Down a perfect watch? No, but it comes really close. 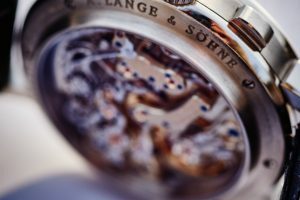 As you probably well know, the contemporary incarnation of Lange & Söhne has been present on the watchmaking map for a mere 25 years. 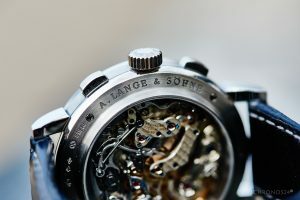 Only after the Berlin Wall fell, Walter Lange (a great-grandson of Ferdinand-Adolf, the father of German watchmaking) was able to fulfil his dream of renewing the reputation of his family brand name. 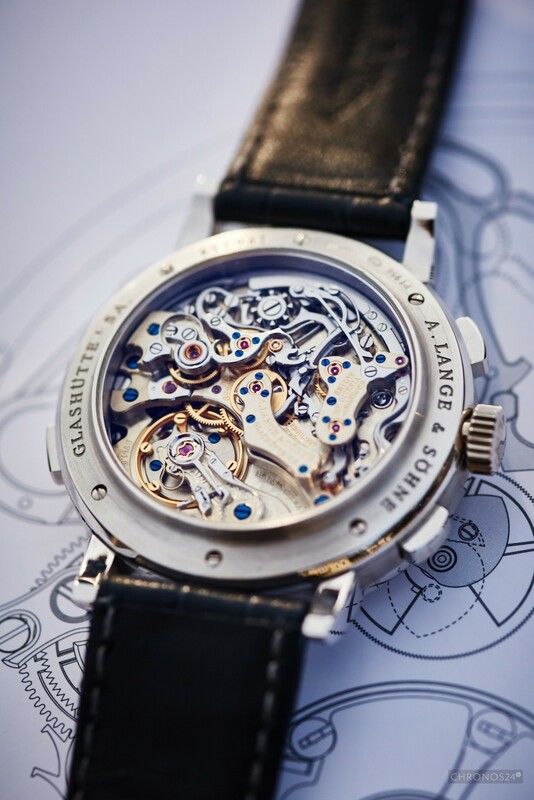 When Glashütte was bombarded by the Allied forces on the last day of World War II, one of the shells hit the Lange manufacture building, and whatever was miraculously left was stolen and taken out of town afterwards, by the Red Army. 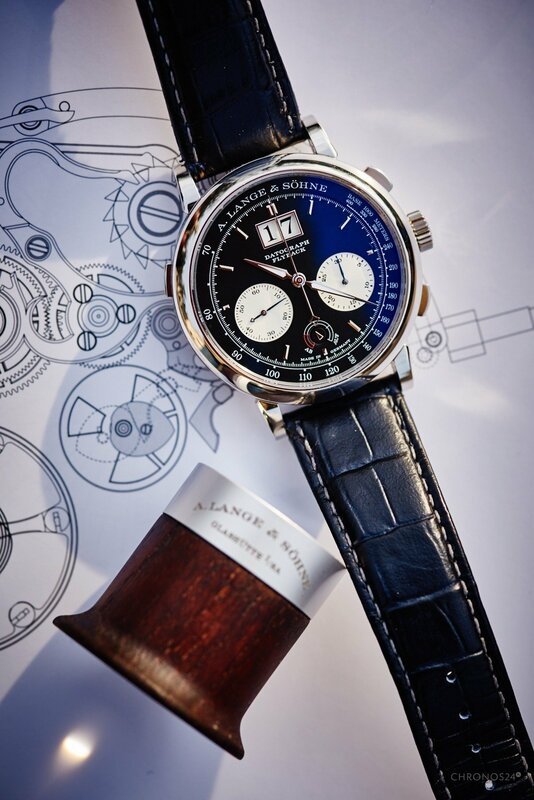 There was no shortage of faith in the heart of Walter Lange and in 1990, with the help of the nowadays Richemont group and Gunther Blumlein, the brand was resurrected. 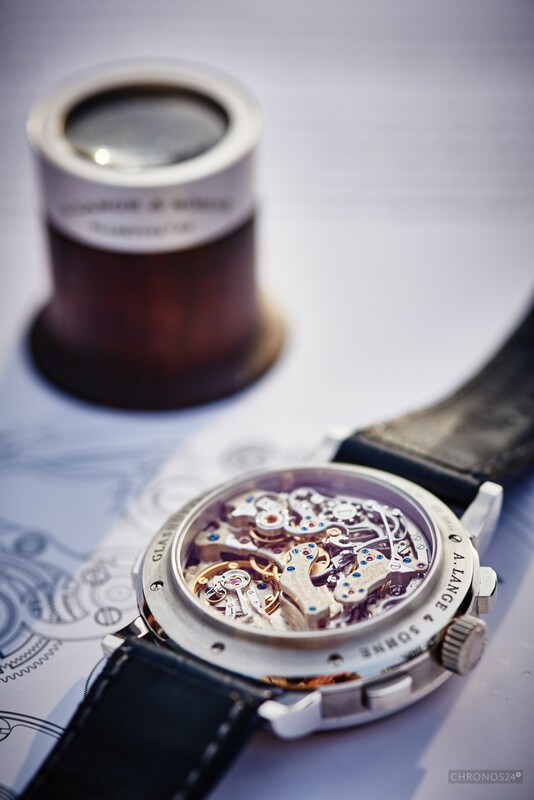 The first collection of four in-house calibre watches came a mere 4 years later. It shaped the way that Lange has taken and which it follows to this day. The company introduced its vision of their own chronograph, named Datograph, in 1990. 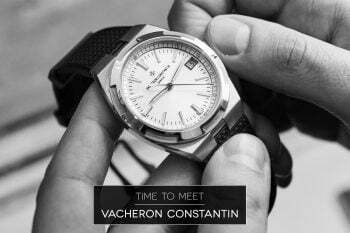 The watch came with a 39mm platinum case, a slightly asymmetrical black dial with a dominant black-on-white date window, and a manually wound calibre (L951.1). Even though it has been 25 years since the premier of the model, it remains sought after and valued, with a prohibitive price on the second-hand market. Because quarter of a century is a long stretch of time, three years ago the Datograph underwent a rejuvenating surgery. Instead of intruding into the design like a plastic surgeon into the face of an ever-dissatisfied woman (where each interference looks more and more grotesque), Lange introduced only cosmetic changes, adding certain features. Probably the most important difference between the old Datograph and its new incarnation was included in the name of the model. 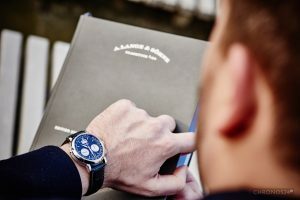 It might seem that Up/Down (or, in the original version, Ab/Auf) means only the indication of the power reserve, but de facto the watch has been equipped with a brand new calibre. 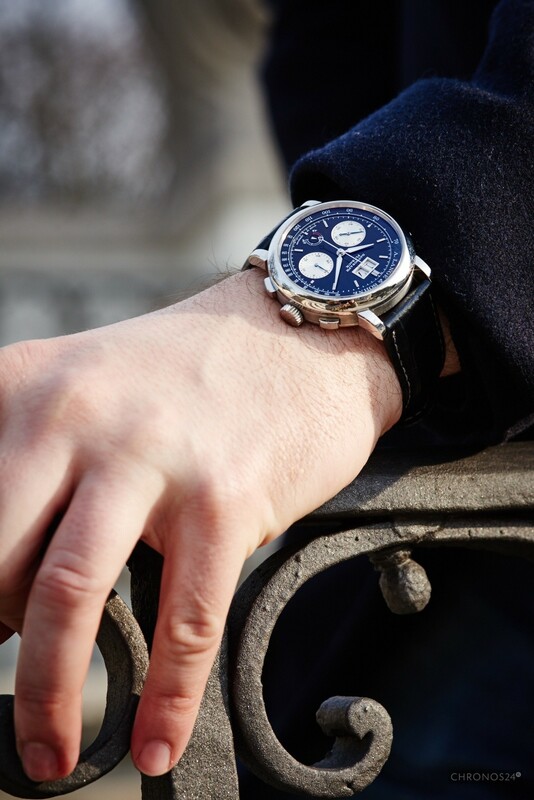 It is still a chronograph, with a big-date indicator, a traditional manually-wound spring and aesthetics of a small piece of art, with a number of little details. One of the larger pains of the old Datograph (although I have not had a chance to wear it for long) was just 36 hours through which the spring could power the mechanism after winding. 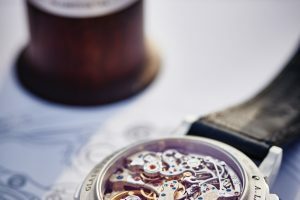 Manual watches give their owners a pleasure of the ritual of winding – some users even claim they have a special bond with their watches – but it is nice to be able to store the watch in a drawer for the weekend without the need of setting the time again on Monday morning. That “problem” was solved by giving the new L951.6 calibre a full 60 hours of power reserve (actually even more than that) accumulated in a single barrel of the mainspring. 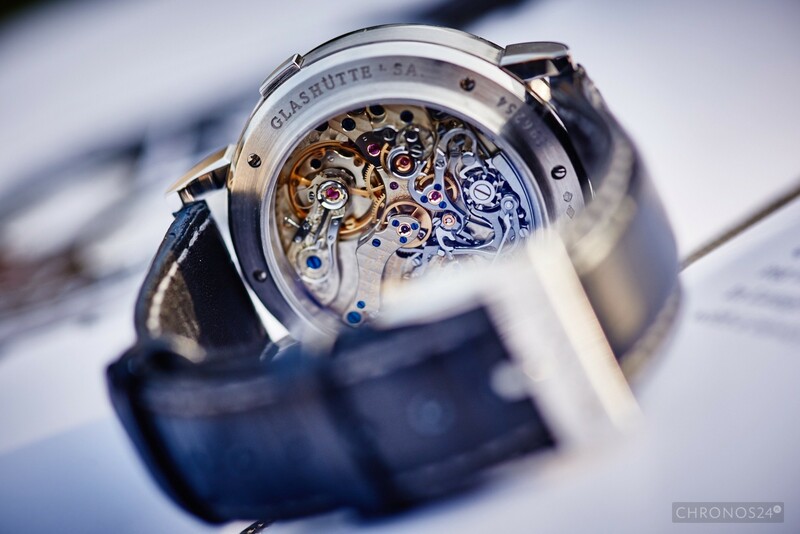 The mechanism has an additional column wheel that assures precise and smooth operation of the stopwatch. 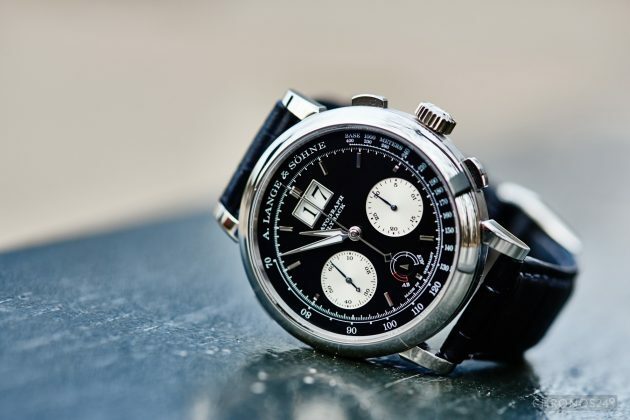 It has the traditional two buttons on the flank of the case – one for starting and stopping and the other for resetting the chronograph. The Flyback feature allows, at any given time, to restart time measurement by pressing the reset button, without actually needing to first stop the stopwatch. What is important is that it is one of the most user-friendly chronographs I have been able to test (and there were a lot of them). Start, stop and reset operate smoothly, the buttons do not need to be pressed with gritted teeth and centrally-mounted seconds hand starts up with no irritating jumps. Because the mechanism works with a 2.5Hz frequency (which is 18000 A/h) a traditional feature with hand-wound watches, the seconds hand moves in a slightly jittery manner, like with vintage watches, and the precision degree is a quarter of a second. 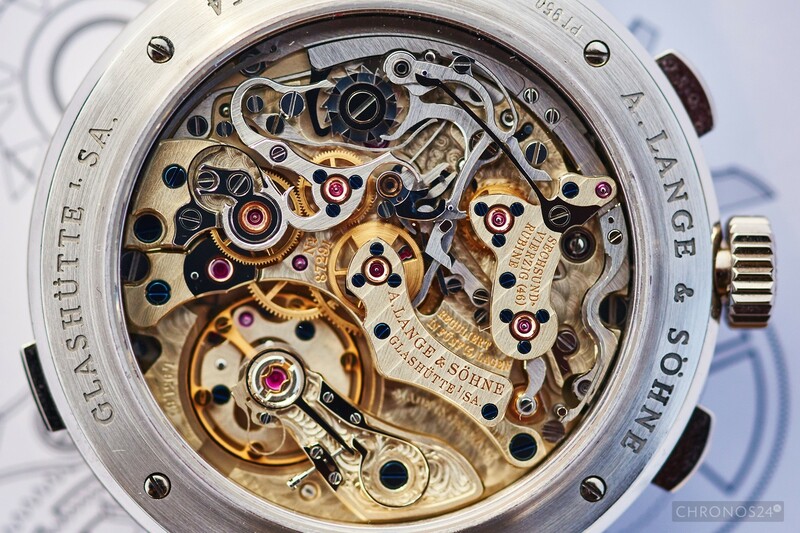 The balance wheel comes with 6 regulating blocks and an in-house Lange hairspring. The minute counter has been produced in an interesting way. 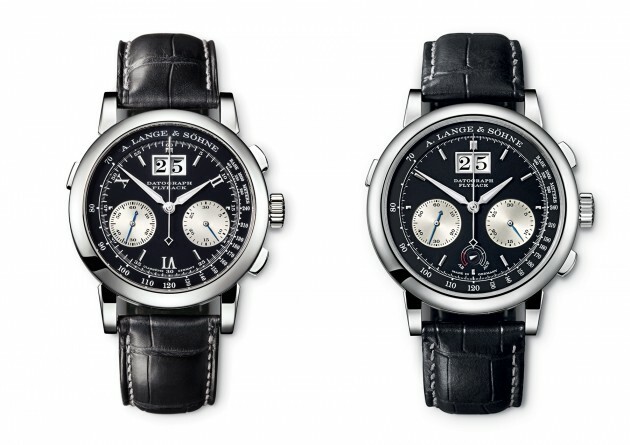 Generally, chronographs come in two groups. In one, the minute hand counts the time moving smoothly with the seconds hand. In the other one, it ticks almost ideally when a minute passes. Almost, because the minute hand starts its visible movement 2-3 seconds before the full minute. 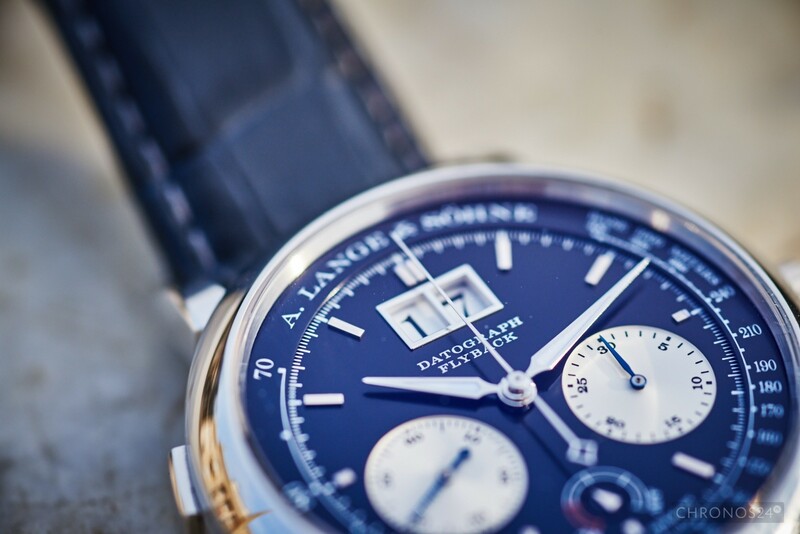 In their mechanism, Lange eliminated the “almost” – the hand moves ideally on the dot. It may seem like a small detail, but it shows the attention the manufacturer pays to the smallest details. 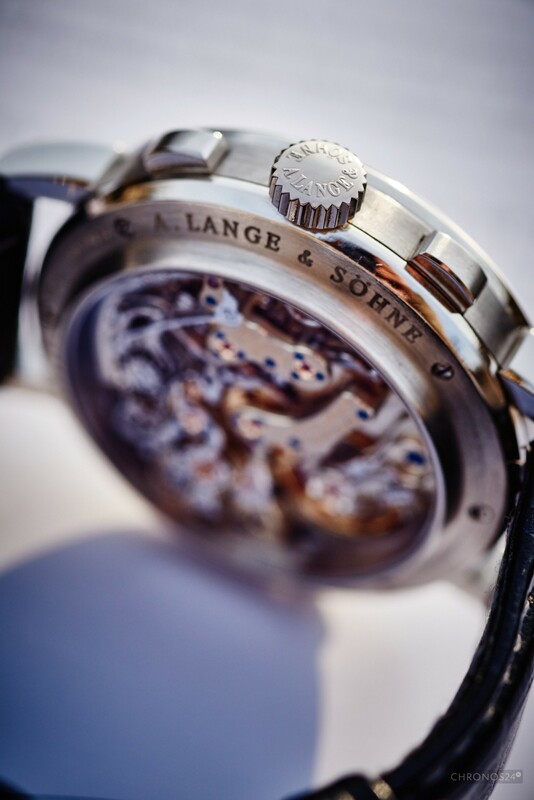 Lange watchmakers designed and patented a dedicated lever with a ruby anchor for the very purpose of this model. The date indicator is a bit less precise. It comes in form of two windows – one with decimals, the other one with units. The discs of both the windows (the decimal disc actually comes in the form of a cross) are white, with black numerals painted on them. The fact that the date does not change ideally at midnight does not bother me much, but I have a larger problem with the thing I observed with Grand Lange 1. For each first 9 days of every month the decimal digit window stays blank (empty white indication) and it looks much less aesthetic than if it contained a zero. Lange is very consistent with this solution, although I fail to understand why. Consistency worthy of approval lies in other aspects of the mechanism and its details such as manually engraved bridge (we wrote about it in greater detail during the visit at Lange) and a wide range of decorations. They are applied manually with meticulousness worthy of highest praise, even to elements that are not normally visible with a naked eye (there is a total of 451 parts). The bridges with broken and polished edges are adorned with Glashütte stripes, thermal screws dyed metallic blue, four rubies set in golden chatons – practically each element of the works is decorative in some degree. Each lever comes with a satin front and polished sides, and the background to all the mechanism is a perlage-decorated plate. I have heard a lot of different opinions about chronographs and at least a few of them put Lange’s calibre at the top of the list of the best mechanical stopwatches. Even if an automatic movement seems a more useful alternative, the “handaufzeug” (German for manually wound) mechanism has a more traditional character. Additionally, L951.6 is easy to operate (stop seconds, quick date correction with a button on the 10 o’clock position) and precise well within the boundaries of chronometric values. I have already mentioned the new Datograph to be not much different from its old version in terms of style – only two details seem important. The case in platinum (grade 950) grew by 2mm and now measures 41mm in diameter and 13mm in height. The 2 additional millimetres may be perceived as a slight gesture (good that it was not exaggerated) towards modern designs and although platinum adds considerable weight to the timepiece, it still wears comfortably and snugly on a wrist. There is no sense in speculating whether 39mm is better than 41mm – the difference is really minimal, practically imperceptible. 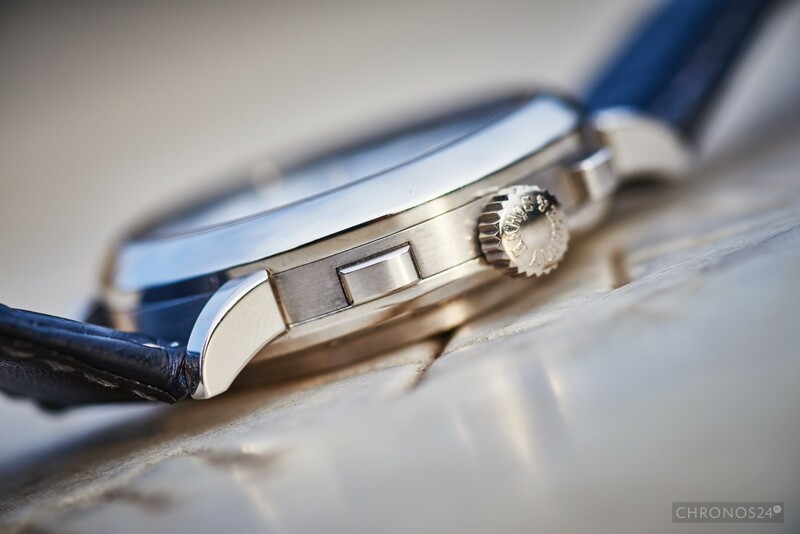 The three-part construction was polished (narrow lugs with slight inclinations, the bezel and the cover ring) while the middle section and the back were brushed. Lange has been using this combination in all their models successfully and to no surprise – the aesthetic brushed and polished, slightly curved case fits perfectly the elegant character of Lange. 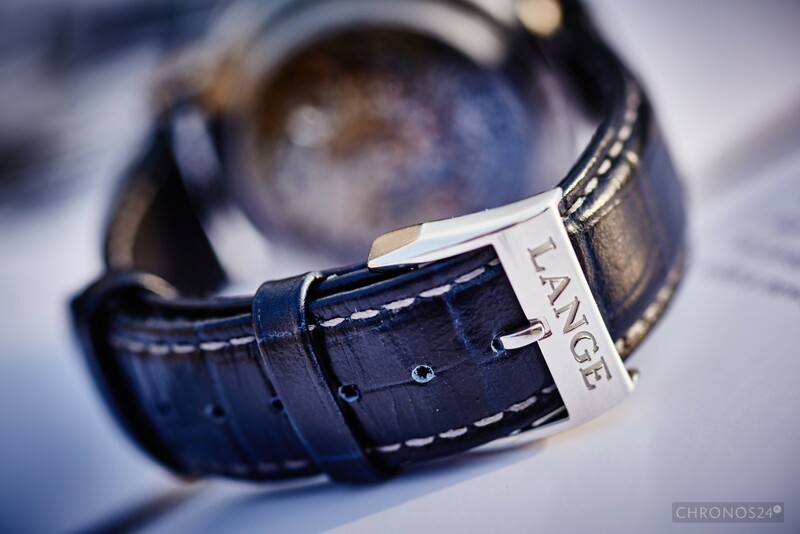 A non-screwed crown with the Lange logo and square buttons are of right proportion and they serve their purpose with no reservation. A. Lange & Söhne rarely fits their watches with black dials. 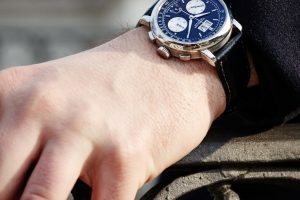 You can count on a single-digit percentage of all their watches delivered in black – more casual and universal than white or silver. The surface of the face is slightly grainy and semi-matt. The construction itself is two-levelled. 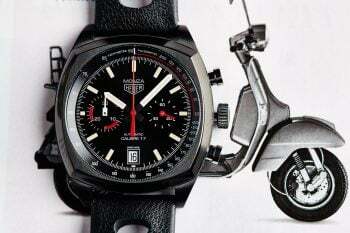 The external ring with the tachometer scale and the manufacturer’s logo (white embossed painted lettering) rises above the rest of the dial. It features square phased indices and the frame of the date indicator in white gold, power reserve indicator and two small sub-dials. They have been placed slightly below the horizontal axis and finished with a snail pattern on the silver background, with black indices. The reserve indicator was visualised as a small rotating disc with a silver arrow and corresponding Ab/Auf scale, where Auf stands for a completely wound mainspring. Two centrally mounted hands – minute and hour – are filled with some luminous matter and these are the only luminous elements on the whole face of the Datograph. Stopwatch seconds as well as small seconds have large counterweights ending in a small rhombus each. 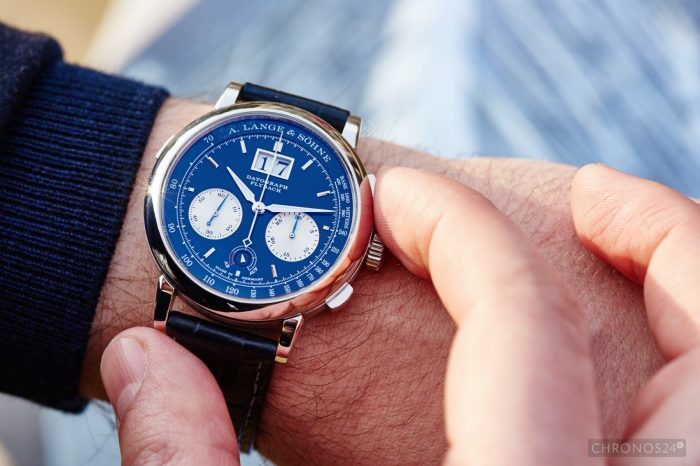 Both small hands (seconds and the chronograph’s minute counter) are blue. Although at first glance there are a lot of things happening on the dial of the Datograph Up/Down, everything is legible, well-executed and fully functional. And beautiful, but this is naturally a matter of taste. Even when you add the complications of a perpetual calendar and moon phase indicator, the design speaks class and elegance. 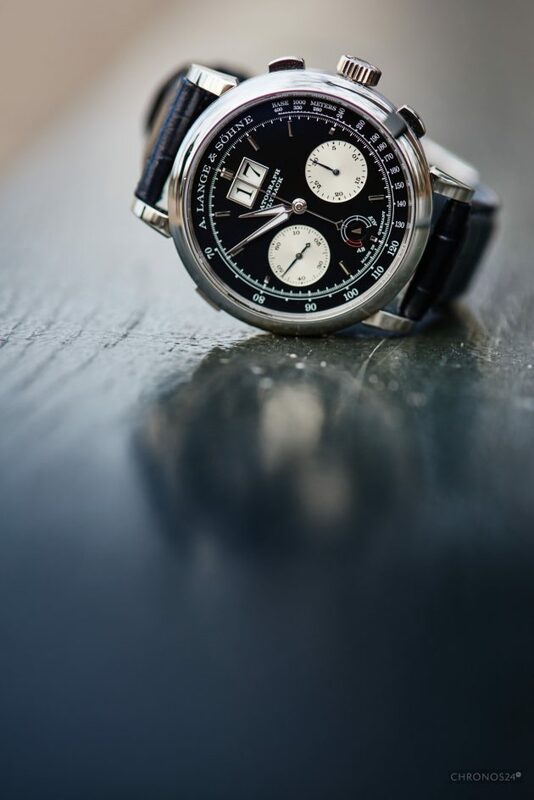 As you might guess, platinum, an in-house movement of such class and the brand must combine to result in a high price of the Datograph Up/Down. A watch in this market segment is simply more than a time measurement device and the way Lange builds their timpieces only makes this impression so much stronger. Each detail is hand crafted, often beyond reason and more for the fact of it being adorned. 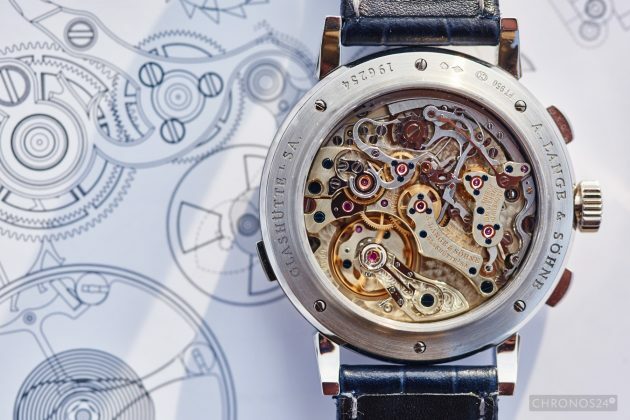 When we consider watchmaking as a form of art, we are more prone to see with the eyes of our imagination a row of watchmakers, slumped behind their weird desks, not a factory with advanced machinery. 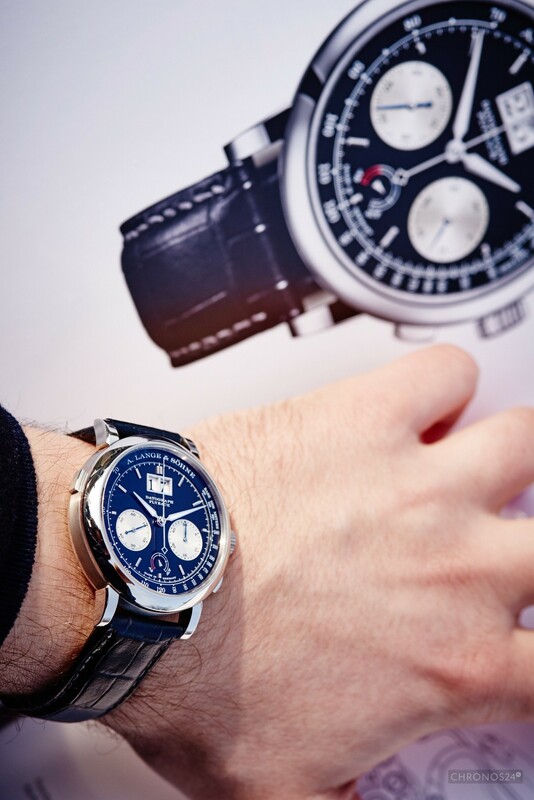 “In Glashütte each watch – be it a grand complication or a simple automatic one – is created with the same large attention”, says Antony de Haas and although you can call it simple boasting, we have seen with our own eyes that it is really so. 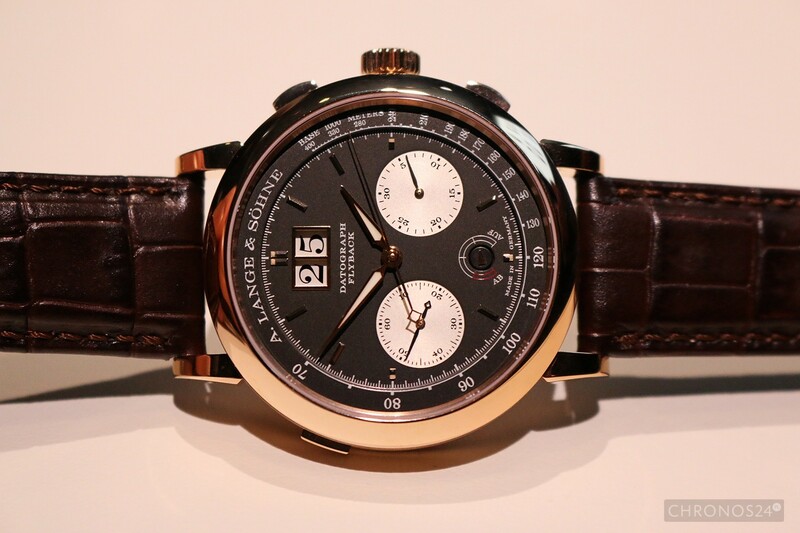 Look at our report on Grand Lange 1 – those same finishes, details, tastes. How much does it all cost, then? Not a little… Datograph Up/Down Ref. 405.035 is worth the price of a new two-room flat in the centre of Warsaw (!) In numbers, it is 75.000Euro. This is with no doubt the most expensive watch we have been able to test so far and – as an irony – one whose price was quite well justified. Putting aside material costs (an ounce of platinum is currently worth 1151 USD) you need to take into account the abovementioned manufacturer’s values, the cost of manual labour, size of the company, its production output (at a level of about 5.000 watches a year) and prestige. Lange was able to build this in only 25 years, and that speaks for the brand much more than anything else. To address the statement from the beginning of this text – Datograph is a complete watch. 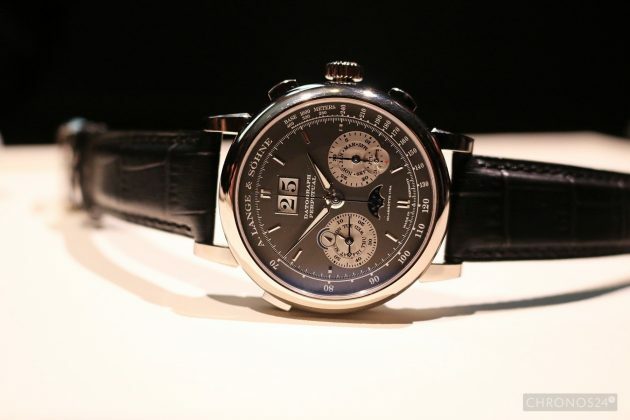 It has everything I look for in a mechanical timepiece, executed at the highest possible level. I have tried for this text not to look like a neverending stream of praise, but it really is such a good piece of a watchmaking. My friends looked at it with careful reserve at first, but afterwards – with each new fact – their eyes opened wider and wider. Naturally, the apogee came with the price. If you wish, however, to purchase the Datograph in order to show off – don’t bother. It is a watch you buy for yourself, for your own pleasure. P.S. At this year’s SIHH Lange presented the Datograph in a pink gold. 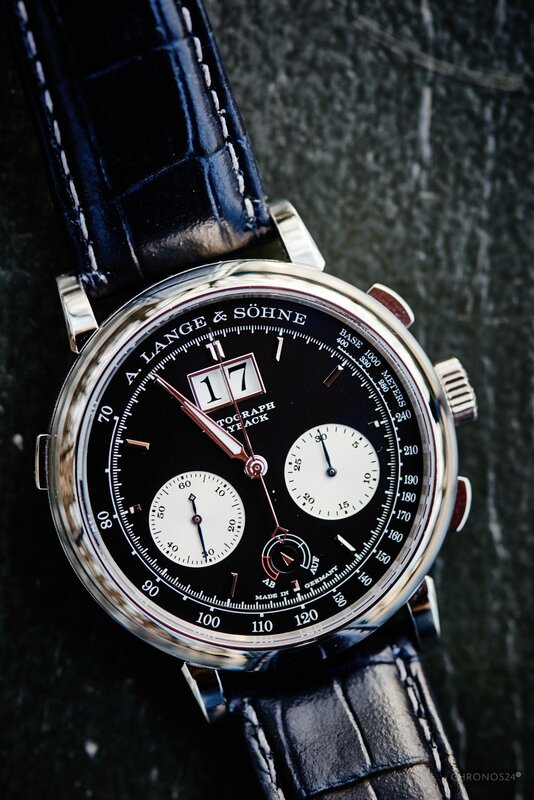 Test watch provided by A. Lange & Söhne.